The Argentine Society for the Study of Mammals (SAREM by its Spanish acronym) was created in 1983 and it currently consists of members from different countries. SAREM is an interdisciplinary society of professionals specialized in natural sciences and its main objectives are the promotion, distribution and development scientific research, the consolidation of collections and investigation centers, and the publication and dissemination of research on current and/or fossil mammals. 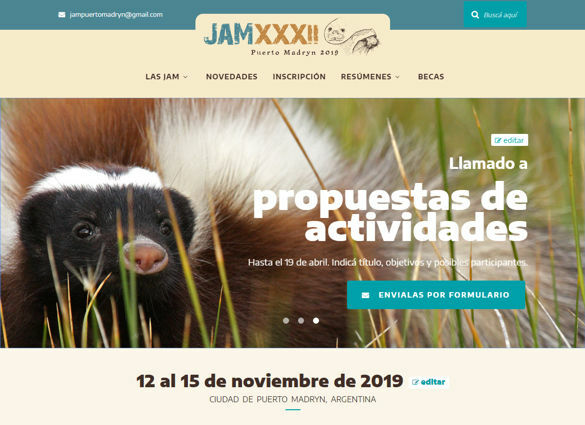 ¡Se inauguró el sitio de las XXXII JAM! El sitio de las XXXII Jornadas Argentinas de Mastozoología ya está abierto al público. ¡Visitalo acá y enterate de las últimas novedades sobre las Jornadas!